Participants at the DFM’s Community Health Learning Symposium strategize ways to integrate community health and residency training. The UW Department of Family Medicine (DFM) welcomed over 60 patients, residents, physicians, staff, public health professionals, community organizations, academic partners and health system partners to its Community Health Learning Symposium, held September 4-5, 2014, at the Fluno Center in Madison. Together, they identified best practices for integrating community health into residency education—work that’s essential to the DFM’s transformation into a department of family medicine and community health. “Expertise, different experiences, excellent planning and enthusiasm made for an exceptionally important and productive meeting,” she continued. The symposium featured keynote speaker Julie K. Wood, MD, FAAFP, vice president for health of the public and interprofessional activities at the American Academy of Family Physicians (AAFP). Dr. Wood talked about how the AAFP is helping family physicians lead health promotion, disease prevention, and chronic disease management initiatives in the communities they serve. Faculty from three top family residency programs—Janice Benson, MD, from the University of Chicago; Freddy Chen, MD, MPH, from the University of Washington; and Viviana Martinez-Bianchi, MD, FAAFP, from Duke University—discussed how they are addressing community health education and practice at their institutions. Strengthening interprofessional relationships to enhance training and care delivery. Robin Lankton, MPH, CHES, the DFM’s leadership project manager and event organizer, said participants brought tremendous energy and enthusiasm to the event, which served as an important jumping-off point for the DFM, its partners and community stakeholders. 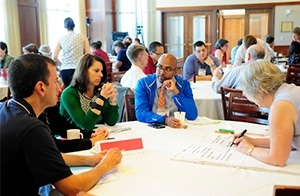 The Community Health Symposium was supported by the University of Wisconsin School of Medicine and Public Health and the Department of Family Medicine, with support from the U.S. Department of Health and Human Services, Health Resources and Services Administration grant D54HP23299.